Maybe you can relate to Marcy’s story. She was at her wits end. It had been a pretty cruddy day. She slept late that morning. Work had been…well, work. Certainly not a vacation. She missed her spin class that afternoon. And to top it off, Peter cancelled their dinner plans at the last minute. Why? To go to a game with some friends. You’ve been there, right? He does something that makes you want to scream. But, like Marcy, you don’t scream. Instead, you call a trusted friend, meet for coffee, and indulge in an epic venting session. Venting often feels good in the moment. But sadly, venting can make things worse in your actual relationship. In fact, research shows that it’s far more likely to intensify negative emotions in the long run. That was certainly Marcy’s experience. As they were finishing up their conversation, Shannon gave her a hug. “Yes, it feels good to talk. I just wish he wasn’t such a jerk.” Even though she’d griped about Peter, she still felt upset. But it’s not good to keep anger all bottled up inside, right? Aren’t you supposed to let it out? That idea came from an antiquated theory of how emotions work. It started back in Sigmund Freud’s day when it was commonly believed that emotions work like hydraulics. As if an emotion was a substance that would squirt out your ears if it did not come out some other way. But modern science has disproven that way of looking at anger and frustration. Emotions arise live, in the moment. They depend on our beliefs and perceptions. That’s why you can be furious one moment, and suddenly happy the next when one tiny bit of information changes everything. Like you miss a flight and feel miserable about the wasted money. But then you learn the aircraft went missing somewhere over the Indian Ocean. Now you feel grateful. And it wasn’t because you “let your anger out,” about missing the flight. Therapists no longer advise people to punch a pillow when they’re angry. Because the research shows you’re better off relaxing your muscles and thinking calming thoughts. Or writing down your options for how to respond to an upsetting situation. You see, anger is not something you can purge. Expressing anger isn’t enough. If all you do is talk about why you’re mad, you’re just dwelling on your anger. And, according to psychological research studies, dwelling on anger will only make you angrier. Which, ironically, SETS YOU UP for a fight with your guy instead of defusing it. Kind of the opposite of what you want. Fortunately, there’s a better way to deal with anger. When you’re angry, it is better to express your anger, but only if you can find a way to do that productively. And despite popular belief, venting is not productive. It’s far better to deal with the stuff that’s frustrating you head on. Here’s how you do that. Talk directly to the person you’re upset with. Not your best friend. Not your mom. Not a co-worker. Your guy. In Marcy’s case, it would be a good idea for her to sit down with Peter and explain that she had a horrible day. When he cancelled their plans, that was the icing on the cake. It really hurt and upset her. Know what you want before you talk to him. The goal is a productive conversation. Before you start talking, it’s important to know what kind of outcome would make you feel better. In other words, know what resolution looks like. When you talk to him, set your focus on resolution. It would be easy to lay into him. Try to avoid that. Instead, shoot for something more than just expressing how you feel. Marcy might tell Peter that she wants him to honor their plans in the future, even if some other awesome opportunity comes up at the last minute. Resolution is knowing that he values time with her. Make sure he knows why you feel the way you feel and how to avoid repeating the situation. 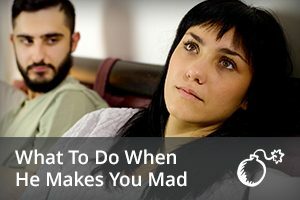 When you’re upset with your guy, don’t just dwell on your anger. While it’s always okay to seek advice from a trusted friend, avoid venting sessions. They don’t help. Instead, make it a point to use the checklist above. That’s a far better strategy for dealing with anger, especially with the man you’re investing your life in. This entry was posted in Dating, Relationships, Self Help and tagged fighting, relationship fights by James Bauer. Bookmark the permalink. Wonder if you might be able to help me out on this one. My boyfriend and I have been together over 3 years. He seems to believe that ex’s are now good friends and everyone should be ok with staying connected. I don’t have a problem a mutual breakup. There are some rules with this strange situation. Never ever talk about our relationship to the ex. Which he does. Does things for her. Tells me after the fact. Naturally I’m upset..I tell him let me know give me that chance to get upset. I probably wouldnt but knowi ing beforehand is the right way to do it. He has a attitude that’s like. Don’t tell me what to do. He even tells me deal with it. The funny thing is i6i love him. We get along great. We only argue about the ex ( sometimes). Should I just accept that this is how he is? I honestly don’t feel or think he’s been unfaithful. What sho6uld I do. Should I stay or go? Hi Mary. It sounds like many relationships I’ve seen before. People often feel a sense of obligation to look after or care for and ask even if they no longer have romantic feelings for them. It’s like a sense of honor or duty to look out for someone with whom you’ve shared a significant part of your life story, even if there’s nothing in it for you. If that’s the kind of motivation that drives your man to stay connected with his ex, and you genuinely don’t believe it’s any kind of romantic thing, then I would encourage you to let go of the notion that all women are competition. Letting go of that idea might resolve much of the emotional tension you feel on a recurring basis surrounding this issue. However, it’s not okay for him to dismiss your feelings and tell you to just “deal with it.” He needs to acknowledge the effect this has on you even if the two of you decide that it’s okay to continue interactions with people from your romantic past. Been dating guy for 2 ys.. We communicate well and are open and honest. My personal assessment and finding of self as well is just becaise you put the dirty laundry out thete dosent mk it “wearable”, or right. At onset, we met thru my hiring and inquiry for assistance. He came highly recommended. I approved qualifications and followed up that I had no intention of relationship or infringement of his bettet half or partner. I yry to communicate upfront at my age. He accepted job and Later that month we dated. He said he lived w his “x”. Of course for financial reasons and because he cared about her well heing as a “friend “. Ok… Im pretty tired of hearing this. They hv no kids and dated 4 yrs. He said he fell out of love. I told him, I might be his midlife crisis. He should try to work it out w her. He refuses to and says he wantsca futurecw me and is in love. I communicated I dontvwant marriage but do want partner. Im 59 going on 29. Youthful spirit and enjoy not only his company and our open communication but enjoy my life’s accomplishments and serenity. What to do? Now, Iis not my first rodeo. Married 2x . Once, 27 yrs once to a friend of 15 yrs aftet his wife passed. Im now a widow too fm my 2nd husband. Hi Susan. It looks like you’re not entirely sure what question to ask. And it seems the reason is because this is a complicated situation. For complicated situations like these, it’s best to use our private advice consultation service. You can also post questions here, but I recommend you keep them more specific. Ask the community of readers one specific question to help them know what kind of response you are hoping for. James, Gosh – that is an interesting concept. And I think you are probably right. My (usual) instant reaction when my guy upsets me is to clam up, ignore him and walk away – head held high and with back ramrod stiff. While that may be good in the moment, as it diffuses the anger and possible conflict, it does not resolve things, because he is sometimes no wiser as to why he has upset me – unless it is glaringly obvious – and you tell us, James, that men are not good at spotting the glaringly obvious!! You also tell us that he does not pick up on hints either. So, he may not pick up the message we are trying to get across. But in our case, he is just as stubborn as me – so, once my anger has subsided, though I send kindly texts and emails afterwards trying to diffuse the situation and asking him to please phone me, he does not always respond to them, so I imagine he is still angry with me. What do I do then, I ask? Go into further backoff mode and keep on ignoring him? Or contact him by phone and appear to be “chasing” him? How long should I wait before I ring him? Hi Lorna. Research from Jon Gottman and others suggests that “repair attempts” (during or shortly after conflict) are the best measure of a couple’s long term viability. 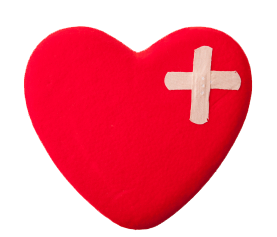 Repair attempts can be things like making a joke in the midst of an argument, apologizing and asking for a new focus on solutions, or even just reaching out to take your partner’s hand (even though no resolution has yet been reached). When you cool off and call him, those are repair attempts. It’s not about chasing him at this point since you already have an established relationship. It’s about investing in repair, healing, and peace. It’s what you both want, even if it’s hard for him to admit it when he feels rejected or angry. James, Thank you SO much for the quick reply. He has still not contacted me after 11 days, even though I have been trying to re-establish contact by sending him little encouraging. loving texts. I was loathe to actually phone him, as I felt he should phone me, as I have asked him to in a text. However, your reply has helped me now see it in a different light. And, as ever, I have to kick my ego into touch. We are both so stubborn and proud. And we have both been badly hurt in the past. Our situation is probably different to most, as he has a drink problem, along with anxiety, depression and low self-esteem – as you may have picked up from comments I have posted on your forum over the past few years. I do love him dearly (and he says he loves me and wants me), and have tried to help get him off the booze, but as we live 3 hours apart and he has no spare money or time to visit me, we see little of each other, and I do all the visiting (which could be seen as running after him, but I feel it is extenuating circumstances). He is always glad to see me, and we get along very well normally – both having interests in music, art, history, etc. – but we quite often end up having a disagreement after a few days, with me walking away – as I see no point in causing a huge row, since it is probably due to his withdrawal, as he never drinks and smokes when I am there. He has told me I have to be stronger and stand up to him. I can’t bear the idea of him making himself ill with the drink. I also wonder, now, if he has PTSD due to his past history, which could account for his anxiety, depression, paranoia, delusions, mood swings and then the drinking in order to cope with all this. I have asked him to speak to the doctor for help with this, but as yet he is not agreeable. He did agree to go to a weekly rehabilitation clinc, but got little support, so stopped going. On top of this, he has a problem with his sight and has to have a difficult operation on his second eye. He plays organ in Church and is choir master, so his eyes are important to him, as that is a large part of his income (not that they are not important to everyone, of course), but that could be causing him added stress at the moment. Most people tell me to walk away and not look back, but I can’t do that. However, one friend has said that sometimes people are sent into other people’s lives for a reason. So I hold onto that. But it is not easy. I truly wish I had read some of the advice you wrote nine months ago, I lost the man that I love, and now I am so sorry. I was totally emotionally out of control. And now he hates me. I just tried to discuss a couple of issues with a guy that I was dating because I wanted to sort them out before they became big. He told me I was too opinionated with a potential to be volatile. He then broke up with me. I was upset for a bit but now I realised I dodged a bullet. He’s only a stepping stone on your path too the right man for you. I sure hope so. I think he is seeing his last partner of 18 months again. So funny if he is. A guy I dated last year went back to an ex-girlfriend after we split and the guy before that was seeing several women. I’m starting to lose confidence here.